QUESTION: If an equitation rider puts in a good ride but his horse makes a minor error like rapping a rail or a spook, how does that affect his score? How much, if any do you penalize a rail down if the fence is ridden well? 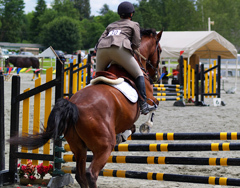 A rider can perform smoothly with an exemplary position, but sometimes a horse’s sloppiness or laziness contributes to a rail down or fault, despite the proper ride. Sometimes a rider had “gotten ahead” or “fell behind” the horse’s motion and thereby caused the knockdown. It is the judge’s responsibility to assess well ridden with faults. We asked our judges for their feedback on this assessment.